In recent news you will probably only see on CNN or BBC or other government propaganda mouthpieces, Israel has carried out a “daring raid” on a Sudanese munitions factory apparently run by Iran. The raid was carried out in the early hours of Wednesday October 24th. 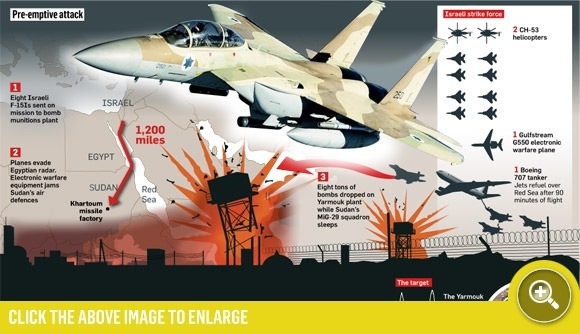 Four Israeli bombers escorted by four fighters, dropped over 8 tonnes of bombs on the Yarmouk factory south-east of Khartoum. Witnesses said the raid caused panic across the city and nearby homes were damaged. 2 people at the plant died in the attack. – Sudan, who is not at war with any surrounding countries nor have they invaded or carried out attacks of any kind against Israel, has its airspace violated by Israeli bombers and electronic warfare planes. – A munitions factory, as shady as this may sound but let’s be honest, countries all over the world have them and are government owned and run and/or privately owned, is bombed and destroyed for allegedly supplying Iran with missiles. – 2 people were killed in the raid. Being in the early hours of the morning it’s likely no one was at work yet however the potential for greater loss of life was still much higher and probably expected. This would be like saying Pakistan launched an air raid with bombers and invaded our airspace and bombed a munitions factory here for selling arms to India. Not only would the world be outraged at such an attack but the people would be screaming out for a retaliatory strike and the main stream media would be all over it. As you can see from what some newspapers did print, propaganda spin doctors would have you believe the heroic Israeli forces launched a “daring” air raid on an evil ally of the dreaded and menacing Iran. They’re also labelling it a “dry run” for an attack on Iran. Yes that’s right they actually used those words. Much like they did pre-Iraq and pre-Afghanistan we again hear the establishment media beating the drums of war. Only this time its to condition the public into accepting a war with Iran. They can no longer use CIA asset Tim Osman AKA Osama Bin Laden as the bogeyman as a pretext to invade. Though don’t be surprised if they still use that famous phrase “linked to Al Qaeda” or “ties to Al Qaeda” in a vague attempt to assume guilt by association. Likewise don’t be surprised if the main stream media establishment uses the non-existent threat of Iran using a nuclear weapon. Let alone obtaining or creating one. Previous American governments and lobby groups have also called for an “Iranian Pearl Harbour”. Better known as a false flag attack as a pretext to go to war. Little do people realise that a war against Iran has already begun. At first it was low key covert operations taking place inside Iran. The Stuxnet & Flame cyber attack against Iran’s nuclear facilities is one example. The assassination of Iranian nuclear scientists is another. Not to mention the constant spy missions by drones over Iranian airspace. One of which was brought down and captured. But now the pressure against Iran is building even greater. Crippling sanctions are ongoing and are an indirect way to wage war on the civilian population of Iran not just its government. Carrier groups and warships from more than 25 nations are in the Persian Gulf right now. War games are the reason we’re given by government mouthpieces. However it doesn’t take a genius to realise that this show of force is actually an invasion waiting to happen at a moments notice. So what does all this mean? War. Another endless war. Much like the quagmire that is Iraq and Afghanistan. And it’s exactly what the global banking cartels and neo-con military industrial complex wants. For it is they who profit from war. I think you have found your calling Mate, great article General!